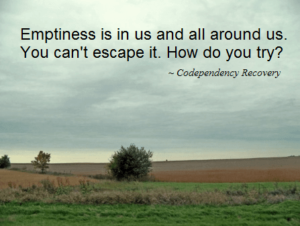 Emptiness is a common feeling, and there are distinct types of emptiness, but it’s psychological emptiness that underlies codependency and addiction. Whereas existential emptiness is concerned with your relationship to life, psychological emptiness deals with your relationship to yourself. It’s correlated with depression[i] and deeply related to shame. Depression may be accompanied by a variety of symptoms, including sadness and crying, anxiety or restlessness, shame or guilt, apathy, fatigue, change in appetite or sleep habits, poor concentration, suicidal thoughts, and feeling empty. Existential emptiness is a universal response to the human condition – how we find personal meaning in the face of a finite existence. It’s associated with “existentialism,” named by philosopher Jean-Paul Sartre and grew out of the nihilism and alienation of post-World War II society. He described the nothingness and emptiness of living in a lonely, God-less and meaningless universe. It’s primarily concerned with social alienation, spiritual bankruptcy, and our relationship to our life, society, and the world around us. This isn’t viewed as a mental-health problem and doesn’t lead to depression. The Buddhists teach extensively about emptiness, originating with Gautama Shakyamuni Buddha in the 6th B.C.E. Their concept is quite different from the ordinary understanding of the word. For rather being a painful emotional state, its full realization provides a method to end pain and suffering and reach enlightenment. Fundamental is the idea that there is no intrinsic, permanent self. The Mahayana and Vajrayana schools go further to believe that the contents of consciousness and objects are also empty, meaning that phenomena lack a substantial, inherent existence, and have only relative existence. For codependents, including addicts, their emptiness comes from growing up in a dysfunctional family devoid of sufficient nurturing and empathy, referred to by psychiatrist James Masterson as abandonment depression. [ii] Codependents experience this to varying degrees. They suffer from self-alienation, isolation, and shame, which can be masked by the behaviors that accompany addiction, including denial, dependency, people-pleasing, control, caretaking, obsessive thoughts, compulsive behavior and feelings such as anger and anxiety. Chronic failure to receive adequate empathy and fulfillment of needs in childhood can profoundly affect our sense of self and belonging in adulthood. Physical separation or emotional abandonment from parents in childhood impacts how as adults we experience being alone, the ending of a relationship, death, or other significant loss. Sadness, loneliness, and/or emptiness, can activate feelings of shame and vice versa. Often, these early deficits are exacerbated by additional trauma, abuse, and abandonment later in adolescence and adult relationships. After a loss, we can feel like the world has died, representing a symbolic death of our mother or of the self, and be accompanied by feelings of emptiness and nothingness. Searching for wholeness through addiction and others provides only temporary relief from emptiness and depression and further alienates us from ourselves and a solution. This strategy stops working when the passion of a new relationship or an addictive high wanes. We’re disappointed; our needs go unmet; and loneliness, emptiness, and depression return. We may long for the initial passionate, vibrant relationship. Unbearable anxiety and emptiness intensify when we try to detach from an addictive relationship, when we’re alone, or when we finally stop trying to help, pursue, or change someone else. Letting go and accepting our powerlessness over others can evoke the same emptiness that addicts experience when giving up drugs or a process addiction. Prolonged shame is coupled with psychological emptiness, whether felt as restlessness, a void, or a hunger to fill it. For some, it's felt as deadness, nothingness, meaninglessness, or a constant undertone of depression, and for others, these feelings are felt periodically – vaguely or profoundly, usually elicited by acute shame or loss. Many traumatized codependents hide a “deep inner hell that often is unspeakable and unnamable,” a “devouring black hole,” which when contrasted with their hollow and empty persona, create a divided self, “massive despair and the sense of broken reality.”[iii] Addicts and codependents often feel this depression when stopping an addiction, including the ending of even a brief close relationship. Same, guilt, doubt, and low self-esteem typically accompany loneliness, abandonment, and rejection. Internalized shame from childhood colors loss and separation– as revealed in a stanza of a poem I wrote at 14: “Yet from day to day man is doomed, his sentence is what others see. Every move is judged and thus an image forms, but man is a lonely creature.” The “image” refers to my self-image etched in shame and loneliness. Thus, when we’re alone or inactive, we may quickly fill our emptiness with obsession, fantasy, or negative thoughts and self-persecutory judgments. We might attribute loneliness and unrequited love to our unworthiness and unlovability. This perpetuates our assumption that if we were different or didn’t make a mistake, we wouldn’t have been abandoned or rejected. If we respond by isolating more, shame can increase, along with depression, emptiness, and loneliness. It’s a self-reinforcing, vicious circle. Additionally, self-shaming and lack of autonomy deny access to our real self and the ability to manifest our potentialities and desires, further confirming the belief that we can’t direct our life. We miss out on joy, self-love, pride, and realizing our hearts’ desire. This reinforces our depression, emptiness, and hopeless beliefs that things will never change and that no one cares. Whether we have existential or psychological emptiness, the solution begins with facing the reality that emptiness is both inescapable and unfillable from the outside. We must humbly and courageously assume responsibility for ourselves, live authentically, and become who we are – our true self. This gradually heals codependency and is the antidote for the depression, emptiness, and meaninglessness that result from living for and through others. See Conquering Shame and Codependency: 8 Steps to Freeing the True You for the entire chapter on emptiness and how to heal. [i] Clive G. Hazell, “A scale for measuring experienced levels of emptiness and existential concern,” Psychological Reports, 1984, 117, no. 2 (1984): 177-182. [ii] James F. Masterson, The Search for the Real Self – Unmasking the Personality Disorders of our Age (New York: The Free Press, A Division of MacMillan, Inc., 1988), 59. [iii] Leon Wurmser, “Abyss calls out to abyss”: Oedipal shame, invisibility, and broken identity,” The American Journal of Psychoanalysis Vol 63, no. 4, Dec. 2002. I loved the solution, "to courageously assume responsibility for ourselves." Sounds so easy, but a long learning process for me. Thanks for the article.